Renegade photographer Philip Volkers’ book “Dust to Dawn” which is to be published by Kehrer Verlag, at the end of August, documents his visual adventures at Nevada’s notorious Burning Man Festival over a 10-year period. Every year 75,000 people descend on an alkaline lake bed in Nevada for The Burning Man Festival, a highly influential festival and heaven for enquiring minds. 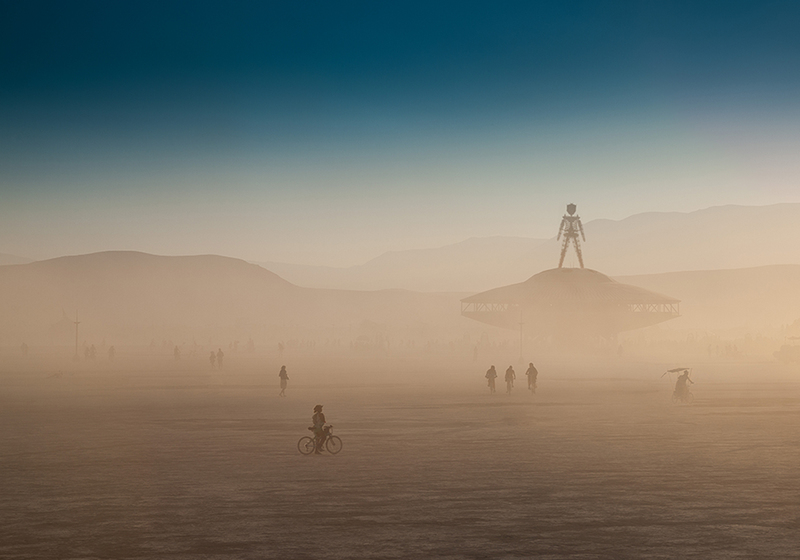 Few people are fortunate enough to experience a decade of Burning Man, one of the most extraordinary human gatherings in the world, but as official photographer, Philip Volkers has captured the many raw and spiritual moments from the festival over the past ten years. The culminated works from his unique vantage point have led to the creation of a new art book ‘Dust to Dawn’ published by Kehrer Verlag and an exhibition of large-scale works to be held at the Bermondsey Project Space before touring to the Lucy Bell Gallery in St Leonards-on-Sea. Volkers’ passion is the documentation of spiritual, hedonistic gatherings, and exploring the meaning behind them. The book “Dust to Dawn”, fully sanctioned by Burning Man, and exhibition showcases Philip Volkers’ work as a photographer, an anthropological enthusiast and documenter of a festival that continues to captivate the world. An exhibition timed to coincide with the launch of the Publication of Philip Volkers book “Dust to Dawn” published by Kehrer Verlag.